Draft: 1999, Arizona Diamondbacks, 18th rd. 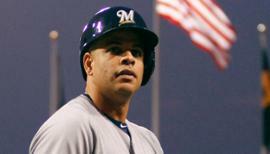 Lyle Overbay reaches on a throwing error by pitcher Edinson Volquez. Lyle Overbay doubles (13) on a fly ball to right fielder Travis Snider. October 30, 2014 1B Lyle Overbay elected free agency. April 20, 2014 Milwaukee Brewers activated 1B Lyle Overbay from the paternity list. April 17, 2014 Milwaukee Brewers placed 1B Lyle Overbay on the paternity list. March 28, 2014 Milwaukee Brewers selected the contract of 1B Lyle Overbay from Nashville Sounds. January 20, 2014 Milwaukee Brewers signed free agent 1B Lyle Overbay to a minor league contract and invited him to spring training. January 20, 2014 1B Lyle Overbay assigned to Nashville Sounds. 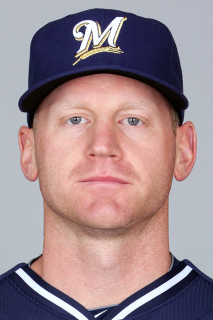 March 31, 2013 New York Yankees selected the contract of 1B Lyle Overbay from Scranton/Wilkes-Barre RailRiders. March 30, 2013 Lyle Overbay assigned to Scranton/Wilkes-Barre RailRiders. March 26, 2013 New York Yankees signed free agent 1B Lyle Overbay to a minor league contract and invited him to spring training. March 26, 2013 Boston Red Sox released 1B Lyle Overbay. January 31, 2013 Boston Red Sox signed free agent 1B Lyle Overbay to a minor league contract and invited him to spring training. November 3, 2012 1B Lyle Overbay elected free agency. September 1, 2012 Atlanta Braves selected the contract of 1B Lyle Overbay from Gwinnett Braves. August 23, 2012 Lyle Overbay assigned to Gwinnett Braves from Atlanta Braves. August 22, 2012 Atlanta Braves signed free agent 1B Lyle Overbay to a minor league contract. August 3, 2012 Arizona Diamondbacks released 1B Lyle Overbay. July 30, 2012 Arizona Diamondbacks designated 1B Lyle Overbay for assignment. June 8, 2012 Arizona Diamondbacks activated 1B Lyle Overbay from the paternity list. December 9, 2011 Arizona Diamondbacks signed free agent Lyle Overbay. October 31, 2011 1B Lyle Overbay elected free agency. August 13, 2011 Arizona Diamondbacks signed free agent 1B Lyle Overbay. August 5, 2011 Pittsburgh Pirates released 1B Lyle Overbay. August 1, 2011 Pittsburgh Pirates designated 1B Lyle Overbay for assignment. December 14, 2010 Pittsburgh Pirates signed free agent 1B Lyle Overbay. November 7, 2010 1B Lyle Overbay elected free agency.